I became completely obsessed with Turkish psychedelic music several years ago and began searching out and accumulating Turkish 45s at a rapid clip. Since then, “Anadolu pop” has been discovered so to speak, with excellent reissues on the market by labels like Finders Keepers and Shadoks. One of the first Turkish psych tracks that knocked me out was the Lambaya Püf De single by the great Bariş Manço (you can hear it here, archived on WFMU courtesy of DJ Trouble – or on the stellar Andy Votel compilation Prog Is Not a Four Letter Word). I noticed at the time that Manço’s song was credited to one Osman Pehlivan. Not long after, I found another version of Lambaya Püf De – a harder-edged cover by Urfali Babi, this time with a song credit to Merhum Osman Pehlivandan. Who was this person? I gradually pieced it together. It’s still commonly performed today. 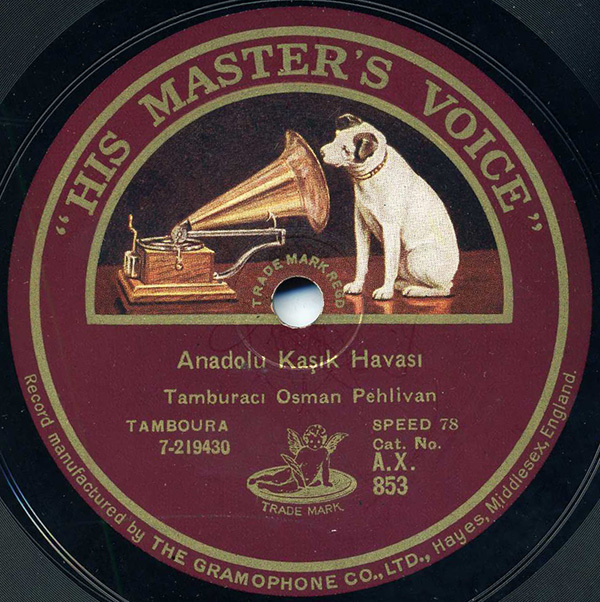 For visual accompaniment, take a look at this performance of the kaşık havası here. Or here. And here are two terrific kaşık players. Even just a few weeks ago, I heard Arif Sag’s version of the song, which is actually titled Osman Pehlivan, and has since been reissued on the new compilation Obsession (and can be heard here, archived by Brian Turner, also on WFMU). The melody will certainly live on. UPDATE: An intrepid reader pointed out to me that a version of this song performed by Pehlivan is available, under a slightly different title, on the Folkways collection “Folk and Traditional Music of Turkey” on an out of print LP, or custom made CD. However, if you listen to the sound clip, one can immediately tell that the Folkways recording is a completely different version than this one, which was no doubt recorded much earlier. great friggin record!!!!!!!!!!!!! no, really great!!!!!!!!!!!!!!!!!!!!!! yowza! i’ve been obsessed with the arif sag version as of late, so it’s particularly thrilling to hear this fantastic recording. also you should listen its “bengi baglama trio” version (for kasik havasi). i can upload it if you want. i hope you continue to send more turkish music. we, as turkish people, do not have much chance to find such records via internet. I recently discovered that this song is “Kolbastı havası” of central Anatolia. When some men decide to have fun in the country, they usually go to a house or to a vineyard which are out of town, and play music, drink alcohol and watch female dancer(s). But these are forbidden by Islam (music is not forbidden by Islam, but some people accept that the music is sin if it is played to make a woman dance) so the police does not allow such actions. There is always a “bağlama”-player to make the woman dance. When the watchman says “Kol geldi.” (police is here) the bağlama-player starts to play “Kolbastı havası” (“kol” is police, “basmak” is to catch [in a sense] and “hava” is song) to warn other men and dancers. They turn off lights, dancers keep dancing without playing their finger cymbals. The high-pitched part of the song is played when the police is near the house or vineyard, and bağlama-player turns back to the normal pitch of the song after the watchman says “Kol geçti” (police went). This kind of songs started to disappeare after ’40s-’50s, since the government is not religion-based after ’20s. For Turkish psychedelic music amateurs. You can find another version of this melody on Baris Manco “2023” album. Track 8 Tavuklara Kışşt De !..